ColorStar is a band that I was a little late in sniffing out (thanks Richard), though I still felt the need to pass along my thoughts on this wonderful new spacerock clan. Better late than never. The quartet is from Hungary, and so immediately I'm drawn to comparing them to Korai Öröm (whom you can read about on page 12), and that's a pretty good start. The 'organic trance rock' pioneered on their '1997' disc (reviewed in AI#4) I believe will prove to be one of the all-time great works in spacerock history. I should feel the same way about 'Heavenicetrip,' but only if it appeared first. So now instead of being a seminal groundbreaking work, it's merely a fantastic album that I will enjoy for many years to come. Not too shabby. Most of the ideas that ColorStar present here aren't really unique, the kind of elements that the Ozric Tentacles and Dead Flowers thrived on for much of the 90's. The quasi-looping echo guitars (featured heavily on the title track, "O-zone," and "Six Steps on the Moon") lay down a blanket of crisp and light arpeggios for the beautiful synth tapestries to further enhance. Some of the bass lines (e.g., "Fix Dance" and "Imarobot") are a tad funkier than is typical for spacerock, but I enjoyed the clean chunky sound. The drummer is excellent and rather intense at times, occasionally augmented with synthetic sounds (e.g., what I'll call 'popcorn percussion'). Here, these programmed parts honestly don't harm the overall flavor one bit... and it's always a danger. The most original aspect of ColorStar's style is the inventive use of vocal embellishments, apart from the rare 'lyrical' vocals. Guitarist András Keleti sometimes recites poetic verse (mainly English), often chants in some strange language (pretty sure it's not Hungarian though... more like Tibetan), and 'half-sings' once or twice. Also, guest Juli Kepes normally has her voice altered in various ways, either repeatedly dubbed or treated in a way similar to the old vocoders that Hillage & Giraudy used in the 70's. Finally, the guitar soloist (whether that's Keleti or Péter Szalay I'm not sure) is a dead-ringer for Steve Wilson... there's one two minute section of the title track that is frighteningly similar to any Porcupine Tree instrumental passage you care to choose. And Podmóbü, what a wondrous piece! What starts out sounding like the Ozrics covering "Run Like Hell" turns light and airy when the guitar solo escapes gravity. 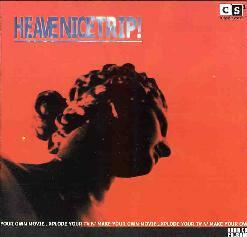 "Heavenicetrip" is such a good name for this excellent album. An hour's worth of just about everything that's great about 90's spacerock all piled into one small piece of plastic. One note: I'm afraid I can't tell you about Track 1 - the CD-ROM track. I lack a computer with a soundcard, so that'll have to remain a mystery until you grab up your own copy. One of the year's best, last year that is! For more information you can visit the Bahia Music web site.